Objective To thematically synthesise primary qualitative studies of the barriers, motivators and enablers of smoke-free homes (SFHs). Design Systematic review and thematic synthesis. Data sources Searches of MEDLINE, EBM Reviews (Cochrane Database of Systematic Reviews), PsycINFO, Global Health, CINAHL, Web of Science, Informit and EMBASE, combining terms for families, households and vulnerable populations; SFH and secondhand smoke; and qualitative research, were supplemented by searches of PhD theses, key authors, specialist journals and reference lists. Study selection We included 22 articles, reporting on 18 studies, involving 646 participants. Inclusion criteria: peer-reviewed; English language; published from 1990 onwards (to week 3 of April 2014); used qualitative data collection methods; explored participants’ perspectives of home smoking behaviours; and the barriers, motivators and enablers to initiating and/or maintaining a SFH. Data extraction 1 of 3 authors extracted data with checking by a second. Data synthesis A thematic synthesis was performed to develop 7 core analytic themes: (1) knowledge, awareness and risk perception; (2) agency and personal skills/attributes; (3) wider community norms and personal moral responsibilities; (4) social relationships and influence of others; (5) perceived benefits, preferences and priorities; (6) addiction and habit; (7) practicalities. Conclusions This synthesis highlights the complexity faced by many households in having a SFH, the practical, social, cultural and personal issues that need to be addressed and balanced by households, and that while some of these are common across study settings, specific social and cultural factors play a critical role in shaping household smoking behaviours. The findings can inform policy and practice and the development of interventions aimed at increasing SFHs. 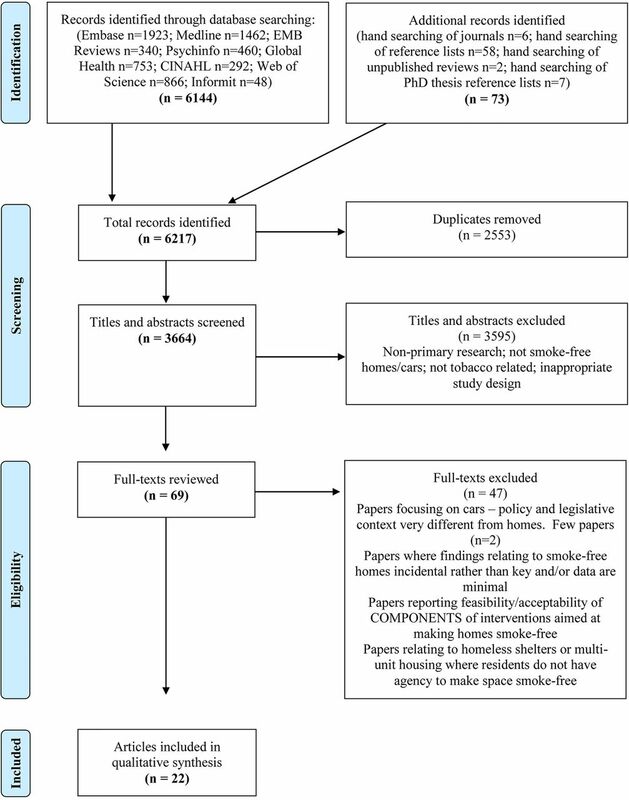 To our knowledge, this is the first systematic review and thematic synthesis of the qualitative literature exploring the barriers, motivators and enablers of establishing and maintaining smoke-free homes. Inclusion of studies from multiple countries, cultural and social settings allowed identification of common barriers, motivators and enablers, as well as how these issues vary within and between contexts. Synthesising the qualitative research evidence can inform policy and practice and the future development of interventions aimed at increasing smoke-free homes. Limitations of this study include the restriction to English language articles, and that the majority of the included studies were conducted in Western countries, potentially restricting the transferability of the review findings and the evidence base. Peer-reviewed journal articles meeting the following criteria were included: English language; published from 1990 onwards; used qualitative data collection methods; explored participants’ perspectives of home smoking behaviours; and the barriers, motivators and enablers to initiating and/or maintaining a SFH. Our definitions of barriers, motivators and enablers are shown in figure 1. Mixed-methods studies including a qualitative component were included. To maximise the diversity of articles, those reporting the views of any household or community member as well as relevant healthcare professionals were included. We excluded non-primary research (letters, opinion pieces and reviews); articles focused on institutional residential care settings or public spaces of multiunit housing (as individuals may have less control over their environment); and articles only reporting the acceptability of components of SFH interventions, for example, air quality monitoring/feedback systems (as these did not address barriers, motivators and enablers to making a home smoke-free, but to the feasibility and acceptability of intervention components).21 Initially we included articles addressing barriers/motivators/enablers to making cars smoke-free but subsequently excluded these as only two articles focusing on cars were identified, and the legislative context of smoke-free cars differs from that of homes. Definitions of barriers, motivators and enablers used as part of the review. We searched MEDLINE, PsycINFO, Informit Online—Health (excluding sports science and HIV), CINAHL, Global Health, Web of Science, EMBASE and EBM Reviews: Cochrane Database of Systematic Reviews, for articles published from 1990 to week 3 of April 2014, using a search strategy based on a modified SPIDER (Sample, Phenomenon of Interest, Design, Evaluation, Research type) tool.22 SPIDER is an alternative search strategy to PICO (Population, Intervention, Comparison, Outcome) for identifying qualitative articles (see20 search terms). The search combined terms for families, households and vulnerable populations; SFH and SHS; and qualitative research. As qualitative articles are poorly indexed,23 we hand searched nine key tobacco, sociological and qualitative research journals, the reference lists of included articles and relevant PhD theses, and undertook key author searching to identify additional articles (see20 for more details and http://www.crd.york.ac.uk/PROSPEROFILES/14115_STRATEGY_20140908.pdf for the MEDLINE search terms. These were modified as appropriate for other databases and are available from the authors on request). Following removal of duplicates, titles and abstracts of identified articles were screened by two authors, with exclusion of those not meeting the inclusion criteria. Full-text versions of the remaining articles were independently reviewed by two authors, with agreement by consensus and differences resolved by a third (figure 2). Search strategy and results flow diagram. Given the ongoing debate24 ,25 regarding methods of appraising the quality of articles for inclusion in qualitative systematic reviews, we appraised included articles for the clarity, appropriateness and the rigour of their methodological reporting, their awareness of ethical issues and understanding of reflexivity using a slightly modified Critical Appraisal Skills Program (CASP) Qualitative Checklist26 and for their conceptual richness.27 To avoid bias, none of the review authors were involved in the CASP appraisal of their own papers. Key characteristics of each study were extracted by one author using a proforma developed for this study and checked by a second author. As some of the review authors were also authors on included papers, no authors were involved in extracting data from their own papers. For each article, all text and participant quotations from the ‘Results/Findings’ and the ‘Discussion’ were extracted and imported into NVivo V.10 (NVivo. Qualitative data analysis software V.10: QSR International Pty Ltd, 2012) for coding. For mixed-methods papers, only the qualitative components were extracted. The search identified 3664 articles after removal of duplicates (figure 2). Following review of title and abstracts, 3595 were removed, with full review of 69 articles. Of these, 47 failed to meet the inclusion criteria and were excluded, with the remaining 22 (reporting 18 different datasets) included. The 22 articles reported on 18 studies from the UK (n=10), Australia (n=4), the USA (n=3), Canada (n=3) and China (n=2) included 646 participants (633 adult household or community members, 13 healthcare professionals). Nineteen of the studies were cross-sectional, with three using longitudinal data collection methods. Data were collected via 58 focus groups, 474 individual interviews, and 2 expert panels between 1998 and 2011. Three articles did not report the year of data collection. Ethnicity was not reported in all articles, but for the 12 that did, participants were Hispanic and non-Hispanic white American, African-American, white British, South Asian British, black British, ‘mixed ethnicity’ British, Australian Aboriginal, Canadian First Nations, Maori, white Australian, Australians born overseas (Greek, Filipino, Scottish, Lebanese, Uruguayan, Arabic, Vietnamese) and Chinese. Three studies purposively targeted ethnic minorities: Arabic and Vietnamese communities in Australia,29 Aboriginal Australians30 and First Nations Canadians31 (see online supplementary table S1). Public indoor smoking restrictions were in place at the time of data collection for 11 of the articles12 ,15 ,29–33 ,40 ,42 ,43 ,46 and not currently in place for 10 of the articles.16 ,28 ,34 ,36–39 ,41 ,44 ,45 For one article,35 it was not possible to establish. The quality assessment of the included papers using each of the modified CASP criteria is shown in the online supplementary table S2. Sixty four per cent (14/22) of included articles were rated high quality12 ,15 ,16 ,28 ,30 ,31 ,34–36 ,38–40 ,42 ,45 by the review team. All were judged to contribute conceptually to the synthesis and were included irrespective of the quality assessment, although the higher quality papers contributed significantly more to the analysis and synthesis. We interpreted seven core analytic themes, six of which cut across barriers, motivators and/or enablers and 23 subthemes (table 1). The results are presented at the level of analytic core themes with linked subthemes, mapped against the constructs of barriers, motivators and enablers, as our aim was to develop a higher order thematic synthesis which goes beyond data reported in the primary studies.17 We have used ‘italics in quotation marks’ to identify primary data quotes from participants, and ‘plain font in quotation marks’ to indicate the article's authors’ interpretations. Table 2 includes illustrative quotes. The references for studies contributing to each of the subthemes are provided with each subtheme title. Three articles31 ,39 ,40 indicated that significant changes to home smoking behaviours were typically only triggered by the physical presence of the baby in the house rather than during the pregnancy (‘none of the participants had considered the need for pregnant women to avoid smoky places or people who were smoking’39) indicating a lack of awareness of risk. These same participants reported that they ‘strongly and unequivocally supported the principle that new-born babies should not be exposed to cigarette smoke’,39 suggesting differences in risk perceptions between unborn and new-born babies and that this may influence motivation for change. Studies reporting how social norms contribute to an individual's lack of agency to make changes in household smoking were from communities where a high value was placed on social relationships, and where smoking functioned as a shared activity and was a positive glue in social relationships, work/business relationships, and at family events and celebrations.16 ,29 ,30 ,31 ,36 ,38 ,45 The articles highlighted that in some cultures and subcultures, it remained normal to smoke, and that in societies where smoking is becoming increasingly denormalised, smoking is not denormalised everywhere. They demonstrate that social expectations of behaviour within a culture (eg, associated with politeness/hospitality with visitors)29 ,45 can prevent household members from challenging others’ smoking behaviours and thus result in a lack of agency to initiate or maintain a SFH. These expectations included ideologies about ‘womanly behaviours’36 such as the good/dutiful daughter in law or wife. This subtheme therefore linked closely to gender imbalance. Leveraging the authority and rights invested in a home owner/head of household role was linked to respect for those roles (see ‘social relationships and influence of others’ theme).28 ,30 ,34 ,39 ,41 ,42 Some articles included observations about the role of non-smoking household members, where those individuals referenced their rights as non-smokers not to be subjected to SHS, enabling them to enforce household smoking rules.41 ,42 This included children.15 ,35 ,40 ,42 Invoking the mothering/home owner/non-smoker roles in these ways was most effective in contexts where not smoking around others was normalised. Agency as a barrier was more commonly coded in articles where there was no SFL at the time of data collection but was still common across articles where there was SFL. This was rooted in continued normalisation of smoking in some communities and households and the importance of smoking as social glue, living in someone else's home, and persistent gender inequalities. Being a responsible parent was never coded as a barrier to SFHs but was coded as an enabler in articles where there was SFL at the time of data collection. This finding was reversed in articles where there was no SFL at the time of data collection. Similarly, smoking being normalised and acting as a barrier to a SFH was less evident in articles after implementation of SFL. These findings suggest that SFL may impact on behaviour to create and maintain a SFH via mechanisms of new community norms around smoking near children and constructs around good/considerate parenting. Households were motivated to make smoke-free rules driven by a desire to live in a clean, odour-free environment, which was linked to a perceived stigma attached to the smell of smoke.12 ,15 ,28–30 ,35–37 ,40–42 ,44 ,45 Households were motivated to restrict smoking in the home due to the perception that having a home which showed signs of smoke exposure (eg, nicotine stains) and which smelled of smoke was ‘socially unacceptable’40 and that there was ‘stigma’35 associated with having a smoky home, furnishings and clothing. While household décor was described by one article as the ‘biggest emerging motivator’,12 this was not demonstrated across the articles within the current synthesis, rather it was the smell of smoke, which was ‘instrumental’41 in the initiation of both discussions about, and the implementation of, home smoking restrictions. Negative social impacts of SFH rules was more commonly identified in articles before SFL but only coded in one article after implementation of SFL. This was also the case for feeling upset or bad or awkward about asking visitors not to smoke inside. Other people, in particular family members, had the potential to influence home smoking behaviours in both positive and negative ways.15 ,16 ,28–31 ,34–37 ,39–45 In households with at least one adult non-smoker, it was reported that in some cases the smoker themselves initiated changes;42 however, frequently it was the non-smoker who instigated discussions41 about home smoking and, in some cases, ‘demand[ed]’ that home smoking be restricted.42 Children and grandchildren also played a role by expressing their dislike of smoking30 ,40 ,41 which helped to motivate behaviour change. Lack of support from household members was a barrier to implementing changes to home smoking behaviours.16 ,28 ,29 ,31 ,40 ,41 ,43 ,45 Healthcare professionals, in particular doctors, were cited as a motivating factor and that receiving advice, in the form of a recommendation,28 ,34 ,41 or as an explicit instruction28 ,41 not to smoke in the home around children prompted discussions, and in some cases behaviour change. These discussions typically occurred when a family presented at the clinic with a child who had a potentially SHS-related illness or an exacerbation in a chronic condition linked to SHS exposure. The perceived benefits of smoking acted as a barrier to establishing a SFH.12 ,15 ,16 ,29–36 ,38 ,39 ,42 Benefits of smoking in the context of ‘relationships with others’ has been discussed earlier, but other personal/individual benefits were described including perceiving smoking as a reward or treat,32 ,33 ,34 a consolation,33 an aid to relaxation,15 ,16 ,29 ,32–34 ,36 or concentration.29 Having to go outside would detract from these perceived benefits. These benefits were described (by some mothers) within the context of balancing their own coping, with caring for children and good parenting. On one hand, smoking was constructed as reflecting an ethic of ‘…caring for self’35 providing mothers with ‘me time’,34 a “‘little luxury’ of having a ‘moment's peace’”34 and important emotional and social support from socialising with others who were smokers.16 ,31 ,34 ,38 Mothers described this as beneficial to the family in ‘coping’34 and facilitating their good parenting, for example, managing stress and preventing them from shouting at their children.12 ,30 ,33 ,34 ,39 ,42 This was linked to addiction and the need to smoke. The initiation of a SFH was associated with unanticipated or unexpected benefits,28 ,30 ,37 ,40 ,42 ,43 and these benefits were ‘self-reinforcing’37 in helping participants to maintain their smoke-free rules. For some household members, the initiation of a SFH helped them to cut down on the amount they smoked. It was rationalised that having to go outside ‘postponed’ or delayed smoking,42 thus helping to remove the ‘autonomic nature of smoking’;37 as well as being ‘inconvenient’.37 The positive reinforcement of cutting down helped motivate household members to maintain their smoke-free rules. In addition to helping to reduce their daily cigarette consumption, the initiation of a SFH may help some household members to quit smoking12 ,28 ,30 ,42 which would in turn help to support longer term maintenance. For example, in the Jones et al12 article, participants who did not have SFHs reported that they were motivated to make their home completely smoke-free as it was perceived that it ‘could be a manageable first step in the complex process of quitting’ and that successfully implementing and maintaining strict home smoking rules might ‘empower’ them to make further positive changes to their smoking behaviours. Five articles28 ,34 ,37 ,40 ,42 reported other potential benefits to the initiation of a SFH, for example, that smoking outside helped facilitate ‘personal’42 or ‘quiet’40 ,42 time for the smoker with some reporting that they actively used smoking outside as a ‘barrier’ or to ‘isolate’ themselves from others.42 These benefits helped to motivate household members to maintain their smoke-free rules. Addiction and habit were raised as barriers to having a SFH in 13 articles.12 ,15 ,28 ,31–35 ,39 ,41–43 ,45 Addiction was presented as a general impediment to initiating a SFH15 ,32 ,33 ,41 or was used to justify breaking existing rules.28 ,35 ,39 ,45 A small number of articles included examples of participants articulating that their nicotine addiction affected their rational decision-making and capacity to convert understanding of risk and their good intentions into action.34 ,35 For some respondents, quitting smoking was seen as a pre-requisite for a SFH, and their inability to quit due to their addiction was therefore constructed as a barrier.32 ,34 Smoking indoors was reported as ‘habitual’ behaviour and something that they had always done and were unwilling to change,12 ,32 ,41 ,42 ,45 or as an ingrained habit associated with other behaviours such as computer use, watching TV or after a meal,12 ,32 ,41 both of which acted as a barrier to creating a SFH. The habitual and normalised use of smoking for stress management presented a major impediment to both the initiation and maintenance of SFH.12 ,28 ,31–34 ,39 Smoking was described as an entrenched-coping mechanism, a familiar comforter and an automatic response to stress. In this qualitative synthesis, we interpreted seven core analytic themes relating to the barriers, motivators and enablers for households creating and maintaining SFHs: knowledge, awareness and risk perception; agency and personal skills/attributes; wider community norms and personal moral responsibilities; social relationships and influence of others; perceived benefits, preferences and priorities; addiction and habit; and practicalities. The synthesis has highlighted the complexity faced by many households in creating and maintaining a SFH, the practical, social, cultural and personal issues that need to be addressed and balanced by households, and that while some of these are common across study settings, specific social and cultural factors play a critical role in shaping household smoking behaviours. The increasing introduction of SFL has led to concerns that smoking may be displaced into the home. While at least one study47 has reported increases in children's exposure to smoking in the home following SFL, others have reported reductions in children's cotinine levels,10 reductions in childhood hospitalisations for respiratory tract infections,48 and reductions in stillbirths and neonatal mortality49 postimplementation of SFL. This synthesis may help explain these contradictory findings. The mechanisms underlying reductions in SHS exposure in the home may include an increased awareness of the harms of SHS combined with a shift in community norms regarding smoking behaviour and the acceptability of exposing others to SHS. By contrast, in other settings, the physical environment, with very restricted outside space, may severely limit the options for smoking away from children and outside the home, thus increasing smoking within the home. Although the prevalence of SFHs is increasing,10 ,11 the findings from this review highlight lack of understanding of SHS exposure and what constitutes a SFH, as well as the fluidity of home smoking rules and the challenge of capturing this fluidity in survey questions aiming to measure SFH prevalence. Asking a single question without further exploration around definition of SFH and transience of restrictions may overestimate the true number of SFHs. It is therefore important to explore fluidity as well as biochemically validate exposure where practical. We conducted a comprehensive search. Triangulation was achieved by involving multiple authors in extraction, analysis and interpretation to ensure that the synthesis incorporated the breadth and depth of experiences reported in the studies. The use of software for data coding presents an auditable pathway from the primary data to the findings. Our review synthesises data from 646 participants across different contexts and in locations with differing tobacco control policy. Even with this diversity, there was consistency in the findings across contexts as the core analytic themes interpreted were described in many of the included articles. Our review does, however, have some limitations. Twenty of the studies were conducted in high-income Western countries, with only two articles from a middle-income country36 ,45 and none from a low-income country, potentially restricting the transferability of the review findings and the evidence base. Additionally, non-English language articles were excluded, further limiting generalisability of the findings. The majority of the studies focused on children's exposure to smoke in the home, with little exploration of risks to other vulnerable groups, including vulnerable adults or pregnant women and their fetus. It was not always possible to explore variation and draw comparisons across the different primary study contexts as these were not always described in detail by the authors. Throughout this review, potential research questions for future studies were identified (see figure 3). Potential research questions for future studies. The interpretations included in this review are from across all studies and contexts in the included papers, and therefore need to be carefully and sensitively applied to households and communities based on their unique physical environments, for example, lack of safe outside space, and their social and cultural norms. As the papers were primarily from high-income countries, the findings may not be generalisable to middle-income and low-income countries. Opportunities for delivering messages for households and communities include mass media campaigns, written resources and guidelines, as well as individual interactions between smoking households and professionals (professionals and other stakeholders who support smoking households). There is preliminary evidence that mass media campaigns specifically targeting secondhand smoke are effective in reducing smoking in the home, while campaigns focusing on smoking cessation are not.50 It is important for professionals to give, and for households to receive, specific and evidence-based risk messages about SHS exposure, particularly risks for older children (as well as babies) and pregnant women. Messages need to make it clear that there is no safe level of SHS exposure, explain what a SFH is, how to make and maintain one, and what the potential benefits of having a completely SFH are. This includes clarity around the lack of efficacy of strategies such as burning candles and opening windows. A key message is that all adult members, rather than specific individuals, for example, mothers, of the household have a responsibility for establishing and maintaining a SFH. In interacting with smoking households, health professionals need to consider SHS exposure and SFH in addition to smoking cessation. For example, if a smoker responds negatively to cessation advice, then the professional should consider exploring the topic of SHS exposure and SFHs. This exploration should include current home smoking rules and whether these are fluid and why. Within these discussions, professionals need to respect and recognise the complexity and challenging circumstances faced by some households, and should aim to prevent further stigmatisation of smoking households who are often doing their best in difficult circumstances. The barriers, motivators and enablers of SFH are likely to be unique to each household, in part relating to social and cultural norms relevant to that household. Professionals should build on positive changes people have already made in their homes, for example, not smoking in the home following the birth of a baby. Professionals might reassure households that others have created and maintained SFHs while successfully protecting important relationships within their family and social networks. Education and training of professionals should develop skills in advising on SFH-related practical strategies, for example, how to overcome weather-related barriers, to support households in having a SFH. Content of SFH programmes should reflect key messages described above, and be informed by the current evidence base, aiming towards a completely SFH. Ideally, programmes should operate at multiple levels and target households and communities rather than simply placing the burden of responsibility on any one individual. Programmes might leverage the structural agency invested in certain roles (and therefore rights) within the household, for example, non-smoker, while recognising that individuals may have limited autonomy in some households or cultural contexts.36 It is important that programmes recognise that individuals within households might require differing levels and types of support. Programmes should consider using an assets-based approach,43 harnessing the steps already made towards SFHs and valuing the motivation of households12 to introduce SFH rules. This recognises that the vast majority of households have some knowledge and make some concessions towards having a SFH, for example, not smoking around a newborn, not smoking in children's bedrooms, and are doing the best they can.38 This approach also aims to ensure that households are not further disempowered or stigmatised.46 Programmes might also contain skills development components, in particular negotiation skills for household members. Many households face complex practical, social, cultural and personal issues in creating and maintaining SFHs, which vary within and between contexts. The findings of this synthesis can inform policy and practice and future development of interventions aimed at increasing SFHs. US Surgeon General. The health consequences of involuntary exposure to tobacco smoke: a report of the Surgeon General. Atlanta, US: US Department of Health and Human Services, Centers for Disease Control for Chronic Disease Prevention and Health Promotion, National Center for Chronic Disease Prevention and Health Promotion, Office on Smoking and Health, 2006. US Centers for Disease Control and Prevention. Vital signs: nonsmokers’ exposure to secondhand smoke—United States 1999–2008. MMWR Morb Mortal Wkly Rep 2010;59:1141–6.
. Prevalence of smokefree home rules—United States, 1992–1993 and 2010–2011. MMWR Morb Mortal Wkly Rep 2014;63:765–9.
. Meta-ethnography: synthesizing qualitative studies. Newbury Park, CA, USA: Sage, 1988.
. A family affair: aboriginal women's efforts to limit second-hand smoke exposure at home. Can J Public Health 2010;101:32–5.
. ‘Do it for the kids’: barriers and facilitators to smoke-free homes and vehicles. Pediatr Nurs 2011;37:23–7, 29.
. Blowing smoke: strategies smokers use to protect non-smokers from environmental tobacco smokie in the home. Health Promot J Austr 2003;14:196–201.
. Parents perceptions of the pros and cons of banning smoking at home. Health Promot JAust 2000;10:252–4.
. ‘Trying my hardest’: the hidden social costs of protecting children from environmental tobacco smoke. Int Rev Qual Res 2008;1:173–94. Contributors MEP conceived the study idea, which was further refined by all authors. MEP, JML and LLJ developed the detailed methodology. MEP and JML undertook database searches and title and abstract review. MEP, JML and LLJ reviewed full-text articles, and undertook data extraction, quality assessment, coding and synthesis, then drafted the manuscript, with conceptual input from JR and JW at key points. All authors contributed to the manuscript and approved the final version. Funding This review was supported and funded from: a National Health and Medical Research Council of Australia Early Career Fellowship (APP1072213), a Cancer Institute New South Wales Early Career Fellowship (13/ECF/1-11), a Wellcome Trust and University of Birmingham Institutional Strategic Support Fund (ISSF) Mobility Scholarship, and a University of Sydney International Research Collaboration Award. Competing interests LLJ receives personal fees from the National Centre for Smoking Cessation and Training, outside the submitted work. MEP receives funding from Pfizer Australia for unrelated research.